OC Prudent Bear: Inventory Threat Level: What Color is Your City? Inventory Threat Level: What Color is Your City? Sorry I haven't posted in a while, my day job has me on planes, trains and automobiles lately. I'm still slammed, but I want to get out this post on inventory threat levels. I've spoken in my last two posts about inventory levels and how they might be leveraged in negotiating prices with sellers. In order to synthesize those posts together, I've developed a simple scoring and rating system that can be used to determine how inventories for given areas compare to the county as a whole. It's a pretty simple system, it takes into account the "month of inventory" and "percent of home listed" stats and creates a compound ranking out of them and then classifies them into a "inventory threat level" grouping. The inventory threat indicates, in my sometimes humble opinion, the amount of risk of significant price decline a city may endure in the medium term. If an area is classified as as blue or green (there are none at this point) there is no or little risk of a significant price decline. If it is yellow there is a moderate risk; orange indicates a strong risk and red a severe risk. Please click the chart for a larger, readable version. My suggestion to buyers is to print this out and carry it with you to open houses. Then ask the Realtor about the price of the house, and then wince as though you just got a shot. Then present this handy-dandy little guide and tell them something along the lines of, "Sorry, but this city has an inventory threat level of orange; so, I would need to make an offer of 15-17% less than asking. Would you entertain such an offer?" Now, here's where your choice footwear becomes important. The agent and/or seller are likely not to like you, your threat level chart or your offer very much, possibly inciting them to rage. If you're in a pair of CFM stilettos or slick-bottomed leather shoes, you're not likely to be able to run away at a safe enough speed to evade these enraged bulls. So, I suggest a good running shoe or a high-quality cross-trainer; they have the traction you'll need. 15 months of inventory for Irvine... Zip shows about 1000 props as of now and Lansner's sales chart by zip-code adds up to 226 for the 22 business days ending March 14. That would suggest inventory a little over four months. Did sales fall off a cliff in the last two weeks? Your chart shows 73 in escrow -- Does that include both pendings and "accepting backup offers" listings? Lansner's chart is total home sales (including new construction) so that could be throwing us off a bit. The data in the chart is from the 16th. I have to admit when I was looking at the data, sourced from www.homeseekers.com I, like you, was struck by how different they were from Jon's data. And yeah, the data do count pendings and backup offers as "in escrow." I don't know the cause of the difference, but I do find it fascinating. Conspiracy theory anyone? I think Zovall has MLS access. Maybe we can have him peek at the numbers when he gets back from vacation. 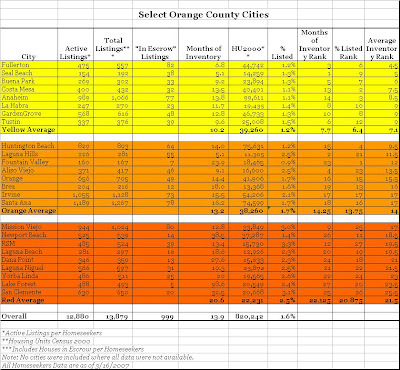 Prices Down in All So Cal Counties! Would You Buy a House from this Man? Are Buyer Demographics Skewing Home Prices? New Poll: At What Median Price Would You Buy?